Happy Easter! The items of Woolworths Catalogue 17 - 23 Apr are party snacks, Easter candies, top brands of chocolate, deli, Easter table decoration, eggs, chocolate bunnies, and many more categories. Buy traditional hot cross buns at Woolworths. The price will be $3.50/pk. Each pack contains 6 of them. Browse a great range of drinks and snacks on pg 2-3. You have Ritz, Captain's Table, Delites, Thins, Cadbury Twirl, and more items with half-price discounts or price drops. Cadbury large blocks of the 350g pack are gonna cost only $5! Like-class confectionery items are in the Woolworths Easter sale. Obviously, Easter discounts are not only candies, snacks or party foods. You can also save on regular items like pantry foods. For example, Nutella hazelnut spread of 750g jar is only $7! Half-price deals are possible savings for all Woolworths customers. You'll be able to shop for needs like Vegemite, Nestle Milo, Nutri-Grain, and more. The Easter deli products including pre-packed salad varieties are on pg 8. 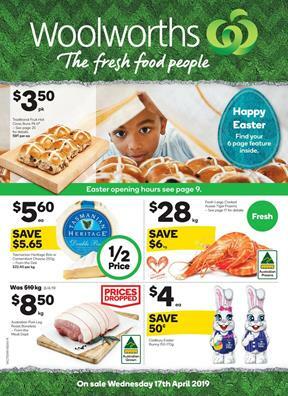 Remember to check out the Easter opening hours of Woolworths. - 19th April is Friday and all stores will be closed. - Stores will reopen on 20th April. - Only some of the stores will be operating on 21sth April. - All stores will be operating on 22nd April. Discover the Easter traditional foods like hot cross buns and table decoration products. Buy small Easter faux moss bunny for only $5! Seafood for Easter is an important part of this category. Find thawed imported ling fillets, large green Aussie banana prawns, lemons, and more on pg 12. A fresh seasoned whole chicken is one of the delicious festive foods on pg 12-13. Improve the taste of whatever you cook with great sauces. Masterfoods tartare or seafood sauce is gonna be a $.40 saving. Cute Easter bunnies, Easter mugs are promotions on pg 14-15.